The weather in recent years has emphasized how fragile the power grid is in the U.S. Snow storms, wind storms, hail storms, tornadoes, and lightning strikes have produced their fair share of power outages. When the power goes out, there are equipment failures, accidents, and an increase in emergency situations. While there are portable generators available for sale at home centers, they sell out quickly when the lights go out. In other words, you aren’t guaranteed to get one and that means having to deal with the outage. When you opt for a standby emergency generator, you don’t have to worry about getting out in bad weather to find a portable generator or having to sit around and tough out the outage. Instead, the power comes on right when grid power is lost so that you don’t miss a beat. What size do you need? This is something that your generator sales representative can answer for you. You can tell them what you want to power and they can recommend the size that will work and its cost, as well as the options that will make it even more convenient and efficient for you. Establish a maintenance schedule because generators can run for long periods of time, making maintenance even more necessary. The oil should be checked every 24 to 48 hours during a run and should be topped off and not overfilled. Coolant levels must also be checked. Every 220 hours, the oil and filter will need to be changed. You can call your generator maintenance professionals to come and take care of maintenance for you so that you don’t have to. This way you know everything is okay with the generator. It is ideal if the fuel type coincides with the fuel type the generator takes is the fuel type that runs into your home. That way the generator can be connected to the fuel line for an uninterrupted fuel supply. These are the very basics of your emergency backup generator with some things to know when you opt to connect one to your home. 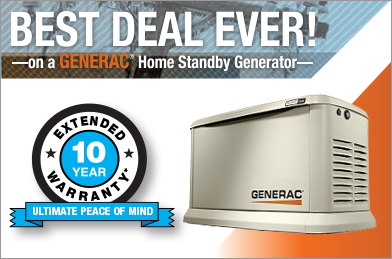 While they can seem complicated, your generator company can simplify it for you. Plus, all of the complexities are easily forgotten when the generator provides power at a time power may not be available otherwise.